QuickPano is a brand new app for the iPhone, ™ . It allows you to view QuickTimeVR cubic and cylindrical panoramas directly on an iPhone. As you move the iPhone device, the app mirrors the movement in the panorama view. Either copy files to your iPhone using iTunes application, or open qtvr files from email attachments or web links. Simply email them a copy of the qtvr file. If your iPhone is plugged into a monitor or projector then the panorama view will be shown on the external device. Add your logo to a panorama/object prior to sharing with others. Although QuickTimeVR file format is well defined and well documented, there are lots of software products which can produce these files. This means that there can be many slight variations in the data within this type of file. If you have a file which QuickPano won't read, then email us the file and we will endeavor to support it. Please email QuickPano support with details of your support issues and a representative will contact you as soon as possible. Can QuickPano open all QuickTimeVR Mov files? Within reason, yes. It is limited by the capabilities of the underlying hardware, making it impossible for it to open extremely high resolution ones. It is also limited in the types of image formats it can read within the qtvr file. When you are generating the qtvr file make sure you use either jpeg or png file formats for the internal images. Does QuickPano work with QuickTimeVR files generated by Artlantis? Yes, we have lots of Artlantis users. Refer to the above question in order to generate compatible files. Does QuickPano open QuickTimeVR Object files? Yes, as of Version 2.5. The same caveats as for panorama files regarding image formats. When generating you object files, use either Jpeg or Png as the image format. 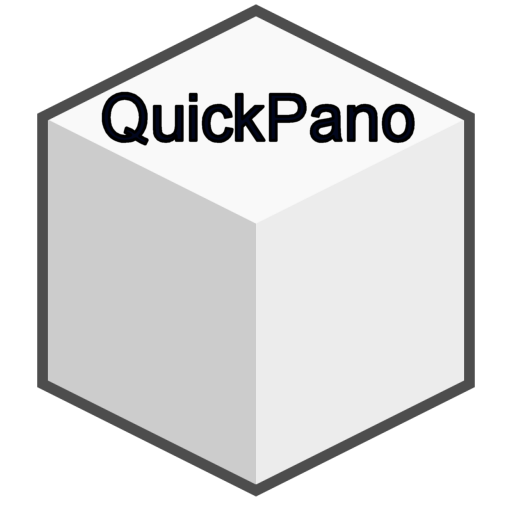 Does QuickPano work with QuickTimeVR files generated by EasyPano? No. EasyPano uses an unusual image format. We are looking ar suporting this format in the next version. Does QuickPano work with QuickTimeVR files generated by Pano2VR? Yes. This seems to be one of the best panorama authoring tools available. Does QuickPano work with QuickTimeVR Object files generated by ModelWeaver? Yes. We've tested their examples and they are compatible. Does QuickPano work with QuickTimeVR Object files generated by Object2VR?